Last month, Yan et al. published their work using CRISPR/Cas9 in ants in the journal, Cell. This research was published alongside Trible et al., which was discussed here previously, based on a preprint version available at BioR𝛘iv. Both studies analyzed behavior and neural development in knockouts of the odorant receptor co-receptor, orco, but, while each employed different ant species with unique reproductive strategies, both got similar results and are worth reading in full. This is the graphical abstract from Yan et al. Yan et al.used a species of ants, Harpegnathos saltator, whose workers arefacultatively sterile, and can become reproductive, and even mate, in the absence of a queen. Like Trible et al. group, they injected embryos with Cas9 protein and in vitro synthesized gRNA. Yan et al. initially had trouble returning injected embryos to the colony, so adapted their rearing methods: embryos were allowed to hatch on agar plates, then the larvae were placed with a few nurses to be reared to adulthood. Another issue they were forced to overcome was that disruption of H. saltator olfaction affected female fecundity and rearing abilities, preventing the authors from establishing a stable orco⁻ line. Fortunately, males were not prevented from mating with fertile workers, so were useful for generating orco⁻/⁻ for testing. This provided an internal control of orcoᐩ/⁻ sisters, although the authors were forced to test individuals blind, then sequence them to determine their genetic makeup. The details of the paper will be useful for any seeking to employ CRISPR in similar species. 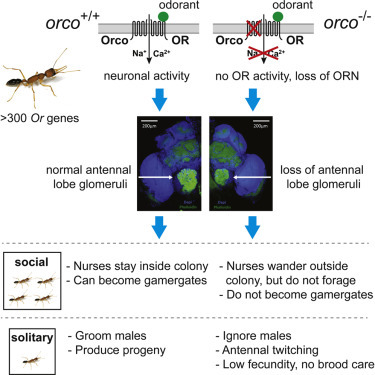 While Yan et al.’s experiments are noteworthy in highlighting the importance of olfactory perception for navigating back to the nest, for initiating competition between workers to become fertile in the absence of a queen, and for enabling a worker to mate and take care of her offspring, what is perhaps most notable is the impact of the orco mutation on neural development. Similar to what Trible et al. found, but contrary to work in Drosophila, loss of orco function in H. saltator resulted in a reduced antennal lobes with fewer glomeruli. The neural makeup of the antennae was also affected; orco⁻/⁻ individuals had fewer antennal neurons, and the remaining neurons failed to form the typical clusters. These results support testing every aspect of a system, since what has been established in one clade may not hold true in another. In the case of the ants, Yan et al. suggests that an orco-independent developmental mechanism, like that seen in Drosophila, is responsible for the formation of a basal number of antennal lobe glomeruli, while the lost glomeruli and antennal neurons are those derived from the expansion of odorant receptors in ant species. This radiation may have required a novel developmental mechanism to expand the basal state to that seen in ants today. Yan et al. highlight a number of questions that their research has opened up, from the evolution of the development of expanded olfactory perception in Hymenoptera, to the role of these odorant receptors in eusociality. Fortunately, Yan et al. has also helped develop a way to answer these questions by being one of the first labs to deploy CRISPR in ant genetic research. Will CRISPR/Cas9 Gene Drives Spread and How Could They Be Prevented From Doing So?